Although I rarely choose to convert other theme formats to Blogger, every so often a design comes along which I'd love to be available for my favourite platform. The Minimal Swiss Design theme by Marios Lublinski (released by Smashing Magazine) is just one of those templates. Ideally suited to artists and designers, this simple and beautiful theme instantly inspired me to create a Blogger conversion (including additional theme options for customizing the design). I'm releasing this Blogger template for free under the GPLv2 License, which means you can use them for all your projects for free and without any restrictions. Take a look at the live demo site to see this theme in action. It features a three column layout with two narrow sidebars which are ideally suited to Picture gadgets for display of visual portfolio items and is wholly compatible with the Blogger template designer for customization of backgrounds, colours and fonts. I've checked the design in a wide variety of browsers and am assured of it's compatibility right back to Internet Explorer 6! This Minimal Swiss Design theme works right out of the box and can be installed in just a few mouse clicks! Once you've downloaded the appropriate file, extract the template to a location on your computer. Now log into your Blogger dashboard and go to Design>Edit HTML. Near the top of this page you'll see a section where you can choose to "Upload a new template". Click this button which will prompt you to locate the XML file for your template. Select your extracted template file and click "Upload". Note: You may receive a notice that gadgets in your existing template are not present in the new design. If you would like to keep these widgets, select "Keep widgets" from the options available (alternatively you can choose to delete these widgets). Once the upload is complete, choose to "View blog" to see the new template in action. 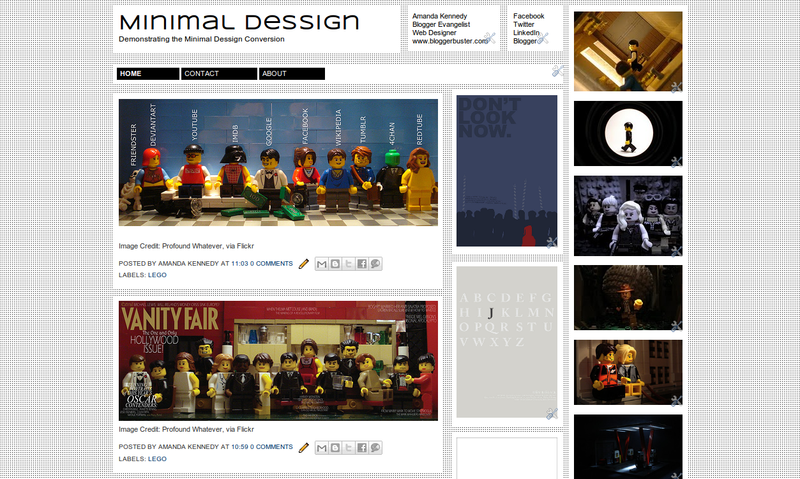 This template was designed primarily to be used as a portfolio site and is very suited to image gadgets in the sidebars. Go to Design>Page Elements to add gadgets to your layout. When you add Picture gadgets through this page, the images you upload will be automatically resized to fit the sidebar's width. Note: Gadget titles in the sidebar will appear if present (using the "Syncopate" font used for the blog title). If you do not want to display gadget titles, do not add a title for your gadget. This template is fully compatible with the Blogger template designer, enabling us to customize the appearance using the WYSIWYG editor with live previews. You can even remove the background image and replace it with an image of your own! This theme was converted from the original Wordpress design by Marios Lublinski, which is distributed by Smashing Magazine. It is available for use under the GPLv2 License which enables free use for all your personal and commercial projects without the requirement of attribution. In other words, you don't have to link back to Blogger Buster or Marios Lublinski (though of course we wouldn't complain if you do!). If you'd like to spread the word about this free template, please link to this article rather than the actual download link so others may find complete instructions for installation, customization and credits. I hope you like this free Blogger template and appreciate your feedback so please feel feel free to leave your comments and opinions below.